Lightweight softshells are a summer staple, keeping out the breeze, shrugging off light showers and providing a little warmth if the temperature drops. When a waterproof shell would be too sweaty or a fleece or insulated jacket too hot, reach for the softshell... The thinnest such tops are barely more than windproofs with greater durability and functionality, and with active summer use in mind it's models like these that we are after in this review. The brief: Light softshell jackets with an active cut for climbing and hillwalking in less extreme conditions. Minimal insulation and good breathability, but a degree of wind and shower protection too. Coolness and breathability for active use in warmer conditions. Overall fit, with a view to climbing as well as walking, when sleeve articulation, hem length and zero hem lift become more important. Is there a helmet-compatible hood, and is it over-helmet or under? And crucially, is there a women's version? General features: Less may be more in a summer layer, but only up to a point. Do the cuffs work as they should? Are the pockets accessible under a rucksack belt? Does the jacket stuff into one of its own pockets for easy packing and hanging from a harness? Lightness - this is a summer review after all. Warmer, thicker softshells may be an advantage in cold conditions - and we've certainly mentioned this where relevant - but in this review we're going light. Value: because no one wants to pay more than they have to. Committed to keeping you warm, safe and dry, Grangers has supported world class climbers and explorers for over 80 years with the best protection possible. Did you know – washing technical clothing in regular detergents might leave them looking clean but can be detrimental to their performance. These cleaners can leave chemical residues that inhibit the technical features, such as enhanced breathability, which you have paid a premium for. Performance Wash gently removes dirt, eliminates odours and removes harmful residue build-up – all while maintaining any existing water-repellency. Grangers Performance Repel is a spray-on product that does not require heat activation, designed to restore the water-repellent finish found on outdoor and technical clothing. Fluorocarbon-free and bluesign® approved, Performance Repel is best applied to a clean, damp garment. Grangers Performance Repel is suitable for use on all outdoor and technical fabrics and is perfect for restoring the water-repellent finishes found on all Gore-Tex® and eVent garments. Designed to work with the specialist materials that make up your technical garments, based on fluorocarbon-free technology, Grangers Performance Wash and Performance Repel restore all technical clothing to its original level of performance. An excellent softshell at a price it's hard to argue with, the Morphosis is a versatile layer for all manner of spring/summer/autumn activities. Its hybrid construction - an ultralight outer backed in places with a light fleece liner - takes the edge off cool weather without feeling too hot and sticky for active use. Great for hillwalking and all-round outdoor use, but when it comes to climbing the cut lets this one down a little. Coming in both men's and women's fit, and a good range of sizes, the Morphosis should be an option for most adults. Hem length is a tad longer than average, sitting comfortably below the waist and dropping a little further at the rear for extra bum coverage. Rather than being a figure-hugging 'active' cut, the body is best described as medium-roomy, with enough space to fit the Morphosis over a couple of under-layers but without being so baggy that it gets in the way or flaps in the wind. The sleeves are quite long, which is good in the sense that they don't ride down your arms when reaching up, but can be a slight irritant when they hang over your hand, since the part-elastic cuff is not adjustable. Despite being long in the body and arms, the tailoring in the Morphosis is a little restrictive when the arms are raised, and if you're climbing in it then the hem readily pulls out from under your harness. For this reason we'd say it's much better used as a hillwalking and general outdoor jacket than a climbing-specific one. At just 345g (size L) the Morphosis is certainly lightweight, though thanks to its fleece component it is less compressible than some unlined models. The hybrid construction of the Morphosis pairs an ultra-thin 20 denier nylon outer with a light grid fleece liner, a setup that will be familiar to fans of similar systems such as Rab's Vapour-rise. The outer has a tiny bit of stretch to help with freedom of movement, but does not feel as tough as most others in this review - a particular consideration for scrambling or climbing. In terms of weather-proofness, the outer cuts out some wind but remains slightly air-permeable for comfort on the move. You can certainly feel a cold wind through the Morphosis, but for spring/summer use it's not been enough to bother us as yet. Inside, the fleece is zoned only over the parts of the body that need more insulation, leaving the sides of the torso and the underside of the arms un-insulated. The net result of this is a top that feels pretty warm for its modest weight, while at the same time being cool, breathable and quick drying when you're wearing it in a sweatier context - perhaps you could say the best of both worlds. Three zipped pockets are provided - two hand pockets plus one on the chest. These are all a decent size for things like a hat, thin gloves or a phone, though none are large enough for an OS map. The lower pockets are obscured by a harness or rucksack hipbelt. Better is the main zip, a chunky and robust YKK Vislon, which is backed with an internal anti-snag draught excluding baffle. Up top, the hood works pretty well, its soft peak and elastic sides giving a nice snug fit around the face (unless it's very windy, when it flaps). There's just about room to wear this over a helmet, though head movement is a little restricted when the main zip is fully fastened. We think this soft hood is actually a bit better worn beneath a helmet. Meanwhile on a helmet-less head the fit can be brought in effectively with the rear volume adjuster. A light peaked brim provides some structure, though it's not rigid enough to resist flapping in strong wind. An elastic hem drawcord rounds off the feature set. For an all-rounder the Morphosis has everything you'd really need, but if we're being picky from a climber's perspective then we'd also have preferred adjustable cuffs, harness-accessible pockets and more importantly an inbuilt stow pocket. When a windshell is too sweaty and a fleece won't cut out the wind on its own, that's where the Morphosis comes into its own. The outer fabric is more breathable than a completely windproof shell, allowing 6 CFM of airflow, which is just about noticeable in the strongest of winds yet sacrifices little protection. Zoned gridded fleece leaves the under-arms and side panels uninsulated, letting you dump heat when working hard without losing wind protection. Semi-elastic hood opening, stiffened hood peak and single hood adjuster. The Alpine Start is an excellent ultralight and packable softshell with an active cut for climbers. Its fit will be particularly good for those looking for a slim garment. At 238g (size S) this is the lightest of all the softshells on test thanks to the thin Schoeller stretch-woven fabric and the lack of "bells and whistles" features; weight conscious mountaineers might be particularly keen on this. At £130 it is however quite pricey and some might find it hard to justify the cost for such a lightweight top, bearing in mind that this thin material seems more likely to scuff and tear in the long run compared to something a bit heavier. If you're only going to be hillwalking in it, and don't necessarily need the climbing-friendly cut, then a runner's windproof might be a similarly lightweight option at a lower budget. The Alpine Start Hoody is available in both men's and women's sizing. Overall the fit is slim throughout its length, with maybe slightly longer arms than average. There is enough give around the arms for free movement, and the body comes down far enough that when climbing it won't pull out from under a harness. The Alpine Start is made using Schoeller stretch-woven softshell fabric which is designed to be breathable and weather resistant but also lightweight, at only 80 gsm. For the sake of this review (well, not quite), our tester took a boulder around the size of a frying pan to the back from 6 metres up. The fabric held up, although our tester's back not so much! It's rugged for its weight then - and it's also stretchy, with a blend of 7% elastane and 93% nylon. Wind resistance is good and breathability high, so for high output activities in windy-but-warm weather this is a good option. However the tissue-thin fabric may not be the best bet for years of hard abuse. As they say, sometimes less is more, and for the Alpine Start this is certainly the case - it's a pretty stripped-down garment. The Alpine Start is one of the lightest and simplest of all the softshells on test: that's not to say though it isn't functional - it's perfectly suited to mountain trad or days out climbing on sea cliffs where the weather is favourable but protection from wind and the odd passing shower may be required. In particular this is a great garmet to stick in your bag on the offchance, as its pack size and weight are tiny. Pocket-wise the Alpine Start has an individual chest pocket, a suitable size for a phone, some energy bars or a compass. This pocket also acts as a storage system for the jacket, stuffing into itself and allowing you to clip it on your harness if things get a little hot. Our reviewer finds the helmet-compatible hood an ideal fit over a BD Half Dome, and this is the way he has regularly used it on cold and windy mountain routes. An adjustable drawcord at the back keeps it securely attached, while in terms of coverage the neck is well protected and only the face exposed - a very nice cut we think. Because of the very lightweight material it's hardly even noticeable with the hood up. The downside of this lightweight fabric on the hood is it that doesn't maintain its shape amazingly in the wind; there's no structure in the brim for instance. To secure the jacket there is a waist drawcord hem, while the cuffs are a simple stretch material. With everything fastened and the hood up you definitely get that 'tucked away' feeling you'll want on a windy mountain route. This interesting offer from Mammut combines light wool insulation in parts of the torso with thick stretchy fleece elsewhere. It struggles to find a place in this particular review, since it's too warm for active summer use and it's not even strictly a softshell. But if you're after some versatile lightweight insulation for more year-round use then the Aenergy IN Hybrid Jacket would be worth a look. It's a lot warmer than the rest, but it's not actually much heavier! There's a lot to like about it, but also, we feel, something of a missed opportunity. If only the cut were better for climbing, this would be an awesome jacket for summer Alpine snow peaks and Scottish winter mountaineering. In its current form, however, it's better used for walking and skiing. Despite its high price we've bumped up its value score in the table above, because you're getting more than a light softshell for your money here. Women and men are both catered for here by Mammut, with female and male-specific fit available. The Aenergy (for short) has quite a slim body-hugging fit, and this includes the sleeves too. Despite this, the stretchy fleece panels are greet for freedom of movement. With its close cut, the Aenergy is best paired with only a couple of light under-layers, but likewise it fits well underneath other jackets. As such, we've used it as a midlayer in winter conditions, and as a light over-layer in bridge-season weather; it's very versatile in that regard. Unfortunately the cut rather lets this jacket down as a climbing piece. Relatively short in the body, and with limited articulation in the underarms, our reviewer suffers from extreme hem lift when his arms are raised (think bare midriff). For that reason alone, it's not a softshell we'd pick for climbing with a harness; for easy solo-ey mountaineering and general walking though, it has proved a bit of a winner. A hybrid of Alpine Wool fill in the front of the torso and thick Pontetorto stretch fleece in the sides, sleeves and back, this is a top that's warm for its weight, wind/shower resistant where that's most needed, and more breathable elsewhere. 'Alpine Wool' is Mammut's own blend of 88% wool and 12% polyester, and in our experience the synthetic element makes it faster drying than we might have expected from a pure wool fill. The wool-insulated sections are shelled with polyamide fabric, which seems to offer a good balance of weather protection, lightness and durability. Given the insulation on offer here the relatively light weight, just 405g (size L), is surprising, and we'd say that Mammut have done well to keep it this low. However the combination makes the Aenergy by far the warmest top on test, far exceeding the 'summer' brief of this group test. For active use in warm weather it would be far too hot and sweaty, and of course it's also considerably bulkier than the rest. However if you need something a bit warmer, for a summer Alpine trip for instance, or for UK winter, this would be the jacket to go for out of the selection on test. For example, for hillwalking and winter mountaineering in classic early spring conditions of warm sunshine and biting wind, our reviewer really rated the fabric and insulation used here, finding it warm enough even in sub zero temperatures while being breathable and quick drying for comfort during fairly high output activity. Two zipped hand pockets are provided; these are quite small, and positioned low enough to be unusuable when you're wearing a harness or rucksack belt. There's no pocket-stowing ability. On the plus side, their mesh lining allows them to be used as vents. The hood fits quite close to the head, and allows reasonable freedom of movement. With the zip done up fully the neck and chin are snugly covered. It won't stretch over a helmet but can if you're desperate be worn under one (though head movement is compromised). A simple stretch hem is the hood's only concession to fitting - there's no volume control - and since the fit around the face is a bit relaxed, and there's no structured brim of any sort, the hood doesn't function well in windy weather. In fact we'd suggest this jacket might have been better without a hood rather than with the one it has, which is of limited use in the mountains (unless you're just sitting around on a chilly evening). With just a light stretch on the hem and cuffs, the Aenergy doesn't allow for any tightening of the fit. This works fine at the wrists, but may in part explain the serious hem lift issue. The Aenergy In Hybrid Jacket by Mammut is a perfect companion for ski touring and other sweaty outdoor activities in winter. It combines an insulating front filled with a wool mix and offers a highly elastic Pontetorto® stretch fleece for an unlimited freedom of movement. A robust, water-repellent polyamide fabric gives the jacket its necessary durability. As a natural insulator, wool is particularly effective and dries quickly. The hood, sleeve and hem closures are elastic, so they guarantee a perfect fit. The Borealis is a great summer softshell that will suit any climber, whether you're seeking out mountain trad, adventures on sea cliffs or even if it's just a wee bit windy for a t-shirt at the low level crags. Though it's quite climbing-specialised, there's nothing stopping you using this for hillwalking too. It's lightweight, breathable for active use and feels very comfortable on the skin, so you can pop it on over most base/mid layers. The price is nice too. Rab offer this softshell in both women's and men's sizing. With a wide shoulder and slightly tapered waist, the Borealis should suit those with a broad back and athletic build. In terms of length we would describe it as a medium length garment, never riding up above a harness but also not dangling off blowing in the wind. The arms are relatively roomy for the size, at least on our skinny tester, and well cut for movement. Overall, size-wise we would say it's at the larger end of the scale, so if you're somewhere between medium and large, for instance, then it's likely medium would be a good bet. Rab have chosen their single weave Matrix fabric for the Borealis which provides excellent durability, wind protection and stretch. These Matrix fabrics have been used extensively throughout the Rab range and from past experience they certainly do what they are designed to. The general feel of the fabric is soft with a good amount of stretch, which is great for comfort, but it does sometimes struggle to keep its shape, especially around the neck where it often seems to bunch. The stretch allowed by the Matrix single weave gives great freedom of movement and this helps keep the Borealis from riding up when your arms are above your head. The fabric used on the Borealis is also what contributes to its very light weight, at just 283g for a size Small by our measure. It may be thin, but it's still tough enough for the hard treatment it gets when climbing. We've had the Borealis on several climbing trips and so far it's held up brilliantly, even to the very rough Lewisian Gneiss on a 10 day trip to the Outer Hebrides. There are two very large and deep chest pockets running almost half the front of the garment. Positioned high enough to access when wearing a rucksack hipbelt or a harness, these are great for storing anything you'd need in a jacket, although if you put something like a phone in there it tends to move around quite a bit while climbing. One large pocket and one smaller pocket might have been better for keeping loose things secure, as two large pockets seem a bit like overkill on a summer weight softshell. The Borealis has an excellent under-helmet hood with some lycra stretch binding running around the opening, keeping the wind from getting down the garment. A simple one-string drawcord allows you to secure the jacket tightly around the waist, and stretch lycra around wrists completes the tucked-away feel. Our lightest softshell jacket, the Borealis Jacket is wind resistant and highly breathable. Whether your objective is The Nose, the Nutcracker, or a day cragging in the valley, it does everything you need it to, in one tiny package. The Dyno Stretch is a favourite among our reviewers when it comes to burly fabric, being perfect for a wide range of rugged activities in cooler and more challenging conditions. If you like lots of features then this jacket may be for you too - it's got a great helmet-compatible hood for instance. But the fabric and features come with a weight penalty, something we have to consider a drawback in this particular review. As a climbing softshell it is also potentially let down by its fit, which is a shame because it has a whole lot going for it otherwise. As such we think this one is better for walking and general mountaineering than rock or winter climbing. A plus point is that this jacket comes in both women's and men's sizes. The Dyno Stretch Jacket is definitely a full featured 'all-mountain' soft-shell, that has more in common with a Scottish winter shell than most of the others on review. With a large over-helmet hood, long arms, wide cuffs (which fit over gloves easily and tighten to your wrist with hook-and-loop tabs), and a two-way zip, this is definitely one of the more robust out there, designed for those rougher spring/summer days, and it would be perfectly at home in the alpine environment too. It is also a little large size-wise, which gives it the feel of an outer layer rather than a mid layer, though it could easily be used as either. However, features are secondary compared to fit and this is where the Dyno Stretch really is lacking, with a lot of lift as you raise your hands above your head. Clearly fit is a personal matter, and we would encourage everyone to try before they buy, but on a couple of different people our experience of it is that the stretch fabric and long arms just aren't enough to stop it raising up your waist when climbing and scrambling (so much so that it requires tucking back underneath your harness after every pitch climbed). The Chameleon3 fabric (174g/m2 89% Polyester, 11% Spandex duplex weave) is one of the thickest in this review, but equally it's one of the most robust and weatherproof. Were we to be out on a cold day, the Dyno Stretch would be high on the list among the softshells on test, as it has a more burly feel compared to most of its lighter rivals. That said, it has also been put through use on warmer days and performed relatively well, not least because of the fact that this is an extremely stretchy and breathable material, and wicks away moisture very effectively. For summer use it is still on the thick and heavy side though, and for comfort on the move it can't compete with the lighter and cooler models on test. Features-wise Montane tick pretty much every box. You get with two hand warmer pockets: mesh-lined so they can double as vents, they are also positioned above backpack belt or harness, and sized big enough to hold a folded map. In addition two smaller chest pockets are also provided. The front zip has two-way zippers for easy harness access, and there's an adjustable/elasticated hem. Were there to be a downside to all this lot, it would be that it comes at the price of weight, with the jacket weighing in at a very hefty 530g. Perhaps this is justified when considering that this isn't just a wind shirt - it's a whole lot more; however it doesn't earn the Dyno Stretch Hoody plaudits in a summer softshell review! One feature that is absent is a stuff sack or pocket to tuck itself into, but due to the specs this is hardly surprising, as this is more of an all-day cool weather piece than an on/off piece. The hood deserves something of a special mention, simply because it is clear a lot of time and effort has gone into its design. Its wired brim means that it remains solid in all conditions and its size means you can fit it on easily over a helmet, without limiting head movement at all. If the volume is too big you've got a toggle to reduce it and this toggle doubles as a method of hood storage (although this isn't a particularly intuitive system and will require you to take off the jacket). Lightweight, breathable and versatile mountain softshell jacket. Updated with Chameleon3 fabric, the Dyno Stretch Jacket delivers wind resistance, wicks hard, dries fast and features a four way stretch. Fully featured, this is a super versatile jacket which can be comfortably worn all day. With its reinforced arm patches, the Fast Climb has an unusual look which tends to draw comments at the crag. This is a softshell clearly aimed at climbers first and foremost, as reflected in its toughness and techy feature set. For more general use, hill walking for instance, it's arguably both on the heavy and the pricey side, but out on the crag - particularly big mountain routes in changeable conditions - the Fast Climb Jacket would come into its own. Still, we've got to ask: did it really need Kevlar forearms? Berghaus isn't offering the Fast Climb in a women's fit this year, which given the number of women who climb seems unfortunate. The fit in general is very spacious, with bags of room in the body and arms for layering over other things; in this regard the Fast Climb is one of the more winter-worthy of the softshells on test. On our 6-foot reviewer the size L is closer to a standard XL, resulting in a bit of a baggy feel; if you're wanting a closer, more streamlined cut then it might be worth trying a size down from your usual. Coming well below the waist, the hem length offers a bit more midriff protection than the shorter jackets on test. Volume adjustment is very effective, pulling the fit in nice and close; the toggles are hidden away on the inside of the hem, while the elastic tails pass up into the hand pockets to keep them out of the way. Between the long body, the stretchy fabric (more on that below) and some decent underarm tailoring, we've found arm movement is unrestricted and hem lift negligible. Tuck the Fast Climb under your harness, and it should stay there all day. The cuffs are massive, easily fitting over a pair of ski gloves, but with plenty of adjustment via velcro wrist tabs. In a winter jacket we'd welcome such wide cuffs, and they do help boost the Fast Climb's all-round mountain credentials, but for UK summer use these still seem a bit excessive, and when tightened around the hand they result in a big flap of fabric that slightly interferes with the clean lines of the inside arm. A weight of 495g (size L) puts the Fast Climb towards the heavy end of our review, and this is perhaps surprising given that there's no insulation layer inside: however the Schoeller Keprotec fabric that it's made from is pretty burly stuff. Reinforcement by way of large Kevlar patches on the forearms boosts the Fast Climb's durability, but is this overkill? We have to say we've never particularly noticed this part of the sleeves snagging and wearing through on a softshell, even after a lot of climbing, so this addition comes across as a bit gimmicky. It probably adds to the weight too, not to mention being a bit scritchy and uncomfortable on the inside against a bare arm. On the plus side the rest of the fabric is very tough and offers a good level of wind and shower resistance. It is also very stretchy, which combines with the active tailoring to give unrestricted movement. While the fabric feels more breathable than we expected for its weight, it still would not be our first choice for aerobic activity in warmer conditions. Two zipped hand pockets are provided, and with enough space for an OS map or a pair of insulated gloves, these are a very useful size. Positioned high enough to be largely usable when wearing a rucksack belt or harness, they're also mesh-lined to allow them to double as vents. However, neither pocket is built to function as a storage pouch, which is a particularly noticeable omission in a softshell that's otherwise clearly been designed around the needs of climbers. A bonus feature is an almost-hidden inside pocket (we didn't discover it for weeks), a tight stretchy sleeve that's designed to hold your smartphone still and secure. This is a nice idea, but good luck fitting a larger phone into it - an iPhone 6 is just about do-able if you take off any protective cover. Easily swallowing a climbing helmet, but also cinching down via front and rear toggle adjustment to give a close fit on a helmet-free head, the Fast Climb boasts a really effective mountain hood. It moves well with your head, zips up high for lower face protection, boasts a brushed chin guard for comfort, and a proper wired brim that holds its shape in a high wind. Top marks to Berghaus on the hood! A lightweight, stretchy softshell designed specifically for protection and comfort when climbing. With high levels of breathability and durability for long days on the crags. Made from a super stretchy weather resistant fabric this Fast Climb Jacket feels super comfortable next to your skin when you're making those high reach dynamic moves but has tough Kevlar fabric across the forearm for protection against the rock. Features a climbing helmet compatible hood and venting hand pockets that can be worn with a climbing harness so you can easily wear it on or off the rock. The ROM jacket has been in Marmot's lineup for years, but has gone through some pretty major changes for this year. This is a decent and well-cut softshell that goes some way in its hybrid design to offer almost hardshell levels of protection on the hood, shoulders and upper chest while letting the sweat out elsewhere when you are working hard. It fits well under a harness or rucksack belt, and is stretchy - so it's great to climb or scramble in. But this makes the non-helmet-compatible hood a bit of a letdown. Add a bigger hood and the ROM would be a great climber's softshell rather than the quite good one that it currently is. The high price reflects its hybrid fabric design, and so too does the relatively high weight. Marmot makes the ROM in both a female and male fit; we reviewed the men's cut. On our reviewer, generally a size M, the medium is a good fit. Marmot call it "athletic" and this seems to mean it will fit broad shoulders and chest but it isn't baggy over the belly. Our reviewer thought the arms and body length seem quite long for a medium, but not excessive for him at 175cm (5'10"). This makes the ROM fit well under a harness and means no sleeve slip when reaching up for holds. The hood has a simple one point adjustment but with a stiffened brim it actually offers decent protection in even wind-driven heavy snow; the main problem with the fit of the hood is there is not enough volume for it to be worn over a helmet with the zip done up. You can pull it up over a helmet, but then don't expect to be able to zip the jacket up beyond the top of your chest, or move your head much. The ROM is now a hybrid softshell jacket that uses Gore Windstopper material over the hood, shoulders and upper chest and arms. Marmot's own M2 fabric, a light non-membrane softshell, makes up the lower body, back and arms. The idea is that the Windstopper keeps the worst of the weather from the most exposed parts of you while your sweat escapes more easily through the woven M2 fabric. Gore Windstopper uses an ePTFE membrane just like waterproof Goretex, but while Gore claims total windproofness for the Windstopper fabrics, they are said to be only water resistant. The whole jacket has a good DWR treatment and light rain still beads-up well even after a couple of washes. Our reviewer is sceptical of Windstopper, having found in the past he got too sweaty in a pure Windstopper jacket. Marmot choosing to mix fabrics might reflect this - the M2 fabric breathes more, although being air permeable you will feel cold winds coming through those sections! Our reviewer has now worn it a lot in the early summer warm weather as well as in the last blasts of winter, and despite initial concerns he has been pleased with the ROM's breathability across that range. M2 is a light stretch-woven softshell with a textured inside, and this makes it pleasant when worn against skin and if only wearing a T-shirt underneath. Both components of the jacket seem tough, and climbing in the ROM has made no marks on them. It is on the heavy side though, at 477g (size M), and doesn't feel as cool and breathable as the real summer lightweights. The ROM has a non-helmet-compatible hood, an outside chest pocket, an inside chest pocket and two hand warmer pockets which remain reasonably accessible with a harness or rucksack waist-belt on. It does not, however, pack into a pocket for hanging from a harness. The cuffs are closed with simple velcro tabs which work over gloves. The sleeves can be pushed up forearms, just, although if you have layers underneath it is not easy. The ROM closes with a midweight YKK zip which is closed at the bottom (hence no easy belay loop access). The Ferrosi has been a popular piece amongst our test team, with a good long body, an excellent active cut, and coming in at a good weight too; furthermore, considering its light weight it still packs a punch when it comes to heavyweight wind. The fact it has few features is a blessing for actually being on the move, since it helps save weight, but what features it does have are simple and effective. For the quality on offer the price is fair too. The Ferrosi is available in both male and female versions. Its cut is truly excellent, with full freedom of movement and limited or no hem lift when raising your arms above the head. It is slim in the body, long in the arms, and has a good drop on the back - hence it stays neatly under a harness whilst climbing, and offers a good level of midriff protection when walking in windier weather. On top the hood features a snug/under-helmet design with a slight brim on the front. Unless we're missing something there's no fancy name for the fabric used on the Ferrosi, but in layman's terms it is towards the lighter end of the softshell spectrum. Two different fabrics are used: an 86% nylon / 14% spandex 90D stretch woven ripstop material in the body and hood, and a 91% nylon / 9% spandex mix of 120D stretch woven Cordura in the shoulders and lower sleeves. The fabric in the body saves weight, while the heavier fabric in the shoulders and forearms is there for durability where you really need it. That spandex content provides one hell of a lot movement too, and coupled with the jacket's light weight (393g size L) it really is a 'fast and light' piece perfectly suited towards a wide range of activities. Breathability is hard to fault, and we've worn it on warm walk-ins and long sunny multi pitch climbs without noticing any sweatiness. Were there to be a downside to a typical summer softshell it would be that its lightweight and breathable nature would generally result in it being less ideal in colder, windier conditions. No such worries with the Ferrosi, however, which is actually impressively wind resistant. That said, given its lightness, this is definitely a jacket for spring - autumn use rather than winter. UK summer hills and crags are really its ideal territory. The Ferrosi is pleasantly lacking in features, with two zipped hand pockets and one chest pocket - simple! It also stuffs into one of the hand pockets for carrying on a harness. Many other manufacturers seem to have spurned this ability, due we suppose to the belief that layers such as this are designed to be worn (i.e. they're so lightweight/breathable that they can - in theory - be worn pretty much from beginning to end of the route). The reality, at least from our experience, is that there's always a time when you don't want to wear a softshell, no matter how light, and so considering its negligible weight a carrying pocket is a great feature to have. The elasticated cuffs are low-profile and comfy, and feature inside thumb loops should you need a bit of extra wrist protection. When a piece of gear has a cult-like following like the Ferrosi Hooded Jacket does, you don't mess with it unless you can really justify it. So we kept everything everyone loves about our tough but breathable do-it-all lightweight weather-resistant soft shell, and added thumb loops and slightly changed the hybrid mapping on the wrists for a fresh look. Light, stretchy, breathable, well cut for movement and with a sensibly minimal feature set, the Squall Hooded Jacket is one of our favourites in the review. Is it a windshell with added durability and functionality, or a tissue-thin softshell? Whatever you call it, this jacket scores a big tick in the 'summer' box. Though its climbing credentials are clear, the Squall is light and breathable enough for sweaty active use too, making this an excellent all rounder that'd be equally welcome on a breezy Munro as a multi pitch climb. Available for both men and women, the Squall has a closer cut than some of the jackets on review. As a result it's best worn over just a few light layers - a baselayer is ideal in our experience, though it will also fit over a thin midlayer fleece too if you need it to. This sizing is optimum for summer use rather than colder conditions. Hem length is slightly more generous than some, sitting just below the waist to offer a good protective overlap with your trousers. The fit at the waist is fine tuned with toggles, and the tails of the elastic are separate rather than a closed loop, so you can't snag them by mistake. Arm length is generous without being excessive, and the simple part-elastic, part-velcro cuffs work well, stretching over a glove if you need them to but also closing down neatly onto a bare wrist to offer a neat low-profile fit. As we've come to expect from Mountain Equipment, the tailoring allows full arm movement with no danger of hem lift. Tuck the Squall under your harness and it'll probably stay there all day. Another feature for which the brand have a well deserved reputation is the quality of their hoods, and the Squall's doesn't disappoint. With enough volume to fit easily over a helmet, this is a proper climber's hood; but with three points of adjustment to take in the slack it fits pretty snugly on a bare head too. Head movement is unrestricted; the lightly reinforced brim offers just enough structure to resist flapping madly in the wind; and the collar comes up high to provide maximum protection for the neck and chin. Because it's quite soft and unstructured, the hood also fits underneath a helmet if you prefer. Overall, this is a feature that we'd struggle to fault. At only 329g (size L) the Squall is one of the lightest softshells in this review, perfectly meeting our seasonal brief. It's made from something called Exolite 125, a softshell fabric that's very much at the thinner end of the softshell spectrum and seems well matched to a summer-oriented jacket. Any thinner and, we suspect, we'd be calling the Squall a windproof rather than a softshell. Though very lightweight, we've found the fabric has excellent wind resistance, and a decent water repellency that will happily shrug off a light passing shower. It also seems tough enough to cope with being abraded on rocks, and after several months' use there is no sign of scuffing on our review jacket. There's a little stretch in this fabric, but it's not as springy as some, Mountain Equipment seemingly relying more on tailoring than stretch for freedom of movement. There's very little to say here, and if you're looking for the lightest possible softshell for summer use then that has to be a good thing. You get a single small chest pocket, just big enough for a smartphone or a hat and a couple of cereal bars. As a sign that the designers have really considered what climbers need in a minimalist jacket the Squall packs into its own pocket, with tabs for hanging off a harness. It's a compact, neat bundle, but the zip opening itself is quite small and it's a bit of a wrestle to get the jacket in; an extra couple of centimetres would've been nice. One feature that initially raised a question mark is the main zip. Offset for comfort under your chin, this is a chunky heavyweight YKK Vislon zip, with an internal storm flap and double zippers for easy access to your belay loop. Did a top this light really need such a robust zip? Well bearing in mind the abuse that this sort of jacket will get over the years, we have come down in favour of it. The ultimate rock climbing Soft Shell; light, tough and protective it's the definitive choice for everything from big walls to sea cliffs. With its cavernous helmet compatible hood, offset front zip and minimalist single pocket design the Squall is truly at home in any climbing situation. A stretchy double weave EXOLITE fabric and precise Active fit offers both the toughness and unhindered movement necessary for those who find themselves making moves on hard rock and ice. At a massive £180 the Agner is one of the most expensive jackets on test, and as such kind of has something to prove. Whilst the body mapping works with regards to durability, it doesn't really in terms of fit, with the restrictive nature of the forearms and elbows providing a real sticking point for our reviewer. Aside from that the rest of the jacket fits him perfectly, with barely any hem lift, a good hood, and two of the best pockets we've come across. At 350g it also gains the accolade of one of the lighter models on test, which is all the more amazing considering that it actually has reinforcement in key areas. This softshell is available for both men and women. Before we go any further we're going to shorten the name of the SALEWA Agner Engineered Cordura Softhell Jacket to 'Agner', as we think we'd all agree that its official title is a little on the wordy side. Now that's over we're going to contradict ourselves, as the 'engineered' element of the full name is quite appropriate in light of the cut, which feels pretty scientific. Where material has been removed, it's been removed; where it's been reinforced, it's been reinforced; and where weight can be saved, it's been saved. The end result is a very slender cut jacket both in body and shoulders, leaving the jacket feeling quite small for its size. The only area where we'd say too much material has been removed is around the elbows, where our reviewer (who's arms aren't that big) felt quite uncomfortable and constricted. As such, we would go so far as to say that this is more of a walker's or runner's fit than a typical climber's fit. That said, despite the issues around the forearm/elbow there is barely any hem lift when raising your arms above your head, which goes to show what can be done when the jacket is cut with that in mind. The hood is of an under-helmet design and is extremely close fitting, the cuffs are elasticated, and the hem around the waistline can be fastened up courtesy of an elasticated cord. The fabric is as much a mouthful as the name of this jacket, with the main material being Durastretch Engineered Eco DWR Heavy BS (BS? We'd hate to suggest what that might stand for, but this sort of marketing blurb does invite mockery). In layman's terms this is a blend of 94% polyamide and 6% elastane (ie. lycra), which makes for something both tough and stretchy - ideal properties in a mountain softshell. The material used has been body-mapped so that certain areas such as the chest, shoulders, and waist have more durability, whereas others such as the back and ribs have less, but are made of more breathable materials - as such this is actually quite a sophisticated jacket, which probably goes a long way to explaining the price tag. Weight-wise it comes in at 350g (size L), which makes this one of the the lighter of the models on test. For a summer softshell review that's clearly an advantage. For active summer use we've found the breathability on offer here is good, while when it does rain the DWR treatment happily resists a light shower. Many of the features have already been covered in Fit and Fabric, with the only remaining feature being the whopping zipped chest pockets, which are placed well up out of harness range and can swallow even the most sizable of guidebooks or maps whole. If you like carrying lots about your person then the fact there's two is a bonus; however the front of the jacket would have been thinner and marginally more breathable had Salewa added only one chest pocket (one biggie being enough for most summer uses we can think of). A men's strong and light, rock-resistant technical alpine climbing jacket with CORDURA® for enhanced abrasion resistance and superior freedom of movement. Lightweight, stretchy, cut for movement and breathable enough for high output summer activities, the Psiphon FL Hoody well matches the brief for this review. Its mapped mix of light and more durable fabrics and its techy feature set are clearly aimed at climbers and mountaineers, but it's just as suited to hillwalking too. This is a great softshell jacket, but thanks to a couple of niggles it is not a perfect one - and at £170 you might be forgiven for expecting near perfection. Arc'teryx make the Psiphon FL Hoody in both men's and women's models. Our reviewer, a Large in most clothing, has had a size Medium in this case. True to our experience of Arc'teryx sizing over the years we'd say this is actually a touch bigger than Large in most European brands, so try before you buy. There's easily room for a midlayer fleece underneath, making this a good choice for winter or alpine mountains; but it manages to be roomy without feeling baggy. Arm length is generous, and with wide cuffs that easily fit over gloves (or roll up over your bulging forearms) and a simple velcro tab closure that makes for a neat fit at the wrist, the sleeves are one of this jacket's strong points. Hem length is about middle of the road, lower at the rear but a fraction shorter than some models at the front, where we think another couple of centimetres would not have gone amiss. The elastic fit adjustment runs only around the rear of the hem, which makes for a cleaner front section; its spare tail runs up inside the jacket to avoid snagging. Thanks to the articulated cut of the jacket, arm movement is unrestricted, though on our reviewer there is a little bit of hem lift when he raises his arms, and when climbing he's generally had to tuck the front of the jacket back under his harness after every few pitches. Removable foam inserts in the hem are designed to help it stay put under a harness, but these seem only partially successful. This is all a function of the fit however, and people with a shorter body might get on fine. In size M (which, as we've said, is more like a standard L) the Psiphon FL Hoody is just 337g, so it's a real lightweight contender. For carrying it can be scrunched up to about the size of a large grapefruit, making this one of the more packable jackets on test. To save weight without undermining durability Arc'teryx have gone for a hybrid construction, putting two different fabrics where each can offer the most benefit. In the main body of the jacket you get something called TerraTex (94% nylon, 6% elastane), a quick-drying fabric with a good level of wind and shower resistance. This has a little stretch for freedom of movement, and certainly seems durable for its lightness; we've also found it very breathable for comfortable active use in warmer weather. Adding a bit of beef in the tops of the arms and shoulders is 'Fortius 1.0' (84% nylon, 16% elastane), a tougher and slightly thicker-feeling fabric used where the jacket is likely to get the most abrasion. It is also a little more stretchy, which helps with overall mobility. The DWR treatment is good throughout (and has so far survived a couple of washes), making the Psiphon FL a decent bet in on-off drizzly conditions (remember those?). A good size for a hat or gloves, the Psiphon's two zipped hand pockets are positioned high enough to remain accessible when wearing a pack belt or harness, while a third pocket on the chest gives you somewhere to carry a smartphone or a ceral bar. All these pockets are mesh-lined so that they can double as vents. From the point of view of warm weather use, the one criticism we'd have about that lining is that it extends across a lot of the front of the jacket: fewer pockets, as per the Mountain Equipment Squall, for instance, would have been marginally cooler. 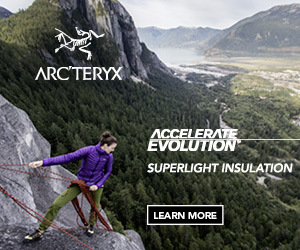 On a softshell that's been explicitly designed for climbing it comes as a surprise that none of the pockets doubles as a harness-hanging carry pouch; Arc'teryx are not the only brand to omit this very useful feature, but given both the packability and the price of the Psiphon it is something we'd have hoped to see. For us, the hood is a nearly-but-not-quite feature. Yes it is big enough to fit over a helmet - but in the case of a modern high-volume model such as the Petzl SIROCCO, only just. Our reviewer has found that with the jacket zipped right to the top the result is restricted head movement when looking up, and a fair bit of hem lift. People with shorter necks and/or smaller heads might get on better. For helmet-free use, three points of adjustment allow the hood to be pulled in close around the head. Without the added bulk of a helmet, the hood moves well with your head, and peripheral vision is good. However in high wind the lack of any stiffening in the brim means it can flap and catch the wind. The collar comes high enough to keep the breeze off your neck, but some other hoods provide more protection for the lower face; perhaps that's not a major concern for summer use. The YKK Vislon main zip is one of the chunkier and more durable on test (albeit not quite as big as the Squall's). For the demands of climbing and mountaineering it seems a good idea to use a tough zip, though it's worth mentioning that the Psiphon's only has one zipper which makes it hard to access a belay loop if it's worn over a harness. The trim fit improves line of sight, minimizes fabric bulk under a harness, and is patterned to climb. Functional articulation is built into the hood and sleeves, and gusseted underarms extend range of motion. The versatile StormHood™ is highly adjustable, allowing it to move freely with the head, provide full coverage with minimal impact on vision, and to be worn with or without a helmet. From sport climbing in Finale to walking up Scafell and trad climbing in the Highlands, Victoria de Ga has been living in Mountain Equipment's Comici Pant and Squall Hooded Jacket all spring and summer. Excellent budget option- £39. I have one of these and it's superb value for money. one small niggle , unless they've changed it, is that the zip is the other way round i.e. the slider is on the opposite side to usual; this makes it surprisingly fiddly to do up. I've always been quick to recommend the Montane Dyno Stretch after buying one early 2017. Light, stretchy, breathable a great warmer weather option. I bought a new one last week (tempted by a Needlesports 50% off deal) and the difference between the old one and the new one was noticeable instantly. Felt much thicker and heavier. The scales confirmed it was 100g heavier (for my XL). I'm no lightweight obsessive but that's a 20% increase on my older one. Big difference between the older Chamaeleon Kinetic fabric and the Chameleon3 fabric. As far as I can see what Montane have actually done is renamed the heavier Alpine Stretch as the Dyno Stretch, and ditch the lightweight previous incarnation. A strange move for a company priding itself on a fast and light philosophy. I live in my Squall and use it for everything from summer cragging and profile photo selfies to bluebird winter days/skiing. Fab jacket. Marrying weatherproof fabrics with a snazzy pile lining, this is a bit of a cutting edge softshell, reckons Dan Bailey. Perhaps the ambitious price tag reflects its 'concept car' status?